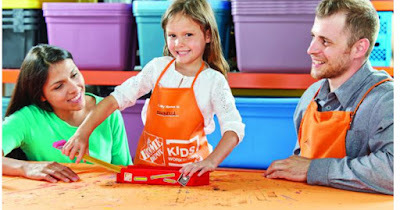 My Tampa Bay Mommy : Sign Up For the FREE Home Depot Kids Workshop (9/2) - Build a Pencil Box! Sign Up For the FREE Home Depot Kids Workshop (9/2) - Build a Pencil Box! The upcoming Home Depot Kids Workshop will be on Saturday, September 2nd, and will give kids the opportunity to build a FREE Pencil Box! All kids get to keep their pencil box and score a free certificate of achievement, a workshop apron, and a commemorative pin while supplies last. These workshops are designed for ages 5-12 and are offered at all Home Depot stores between 9am-12pm.